Brain-bendingly good muffins, scone and lunch, too. Mon, Tues, Wed, Fri, Sat — 7 a.m. to 4 p.m.
Thurs. — 7 a.m. to 8 p.m.
Sun. 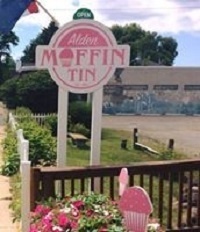 — 8 a.m. to 2 p.m.
Planning to have a meal in the Alden area? Use these great tools to find things to do, before and after. Or simply type Alden into the article search at the very top of the page.